Living on a TIGHT Budget BUT Still Having Fun!! Wow! Has it really been OVER TWO years since I last visited my poor, lil' blog? SO much has happened in my life that had changed my life permanently. Some good...some really, really bad. If I'm not careful, this could turn into a memorial blog! Ugh! Let's start with the good in no random order all over the place! Molly-Mae is an absolute blessing in our lives. She has quickly become Hendrix's sister & BFF. She was a rescue from the Harnett County Shelter....her "day" was the very next day after a friend of my sister's went and grabbed Molly-Mae and her brother out of there! Lisel saved their lives, no doubt! Hendrix is doing great! Only I would have a pup with OCD! The Prozac has worked wonders and life is good again! lol Go figure! He is my boy! Rich got another baby to love on. His best friend & his fiancee had Desmond a few months back. Sometimes I feel guilty because of how much he LOVES babies and kids and he never had the chance to be a dad...other than Dad #2 to Taylor and a furrydaddy to the babies. He really would have been an amazing one. Rich & I had a good time this past Halloween being big kids! His was an 80s Rocker & I was his Groupie! I donated 21 inches of my hair to Wigs for Kids in Memory of my Taylor. I was challenged by a friend of Facebook to post 5 photos that make me feel beautiful. The 5 I chose didn't necessarily highlight my "best" outer beauty, but to me, they represent the most beautiful things about my life: passionate love, great friends, inner peace and success/intellect/education. Presley Shane Passed away in March 2013 after a super quick illness. He was a tough little guy who didn't show pain. As soon as he started showing outward signs, we rushed him to the Vet and it was already too late. The doc thinks it was a tumor. He is missed so, so much by mom & dad, but even more so by his brother, Hendrix. In April, 2013, I held my beautiful, courageous, and very sick niece's hand as she left this world at age 17. Taylor was more like a daughter to me than a niece. She was also my best friend. She and I did everything together. Rich and I were talking and EVERY memory we have involves her in some fashion. I will be writing a separate post to not only explain what happened in or to raise awareness of proper blood collection procedures, but also to introduce to the amazing young lady. She will always, always have half of my heart. I am truly an incomplete person now. I have never felt this hollow and empty in my life. Taylor - Before her illness. Taylor & Uncle Rich - the night she earned her Gold Belt. Taylor & me when she was in the hospital. I am going to try my best to breath some life back into this blog. I hope you will come along for the ride. This post is LONG overdue! At around 3:30 am on December 26, 2012, I said good-bye to my very best friend. Lisa-Marie was my furry baby, but she was also my faithful, loyal best friend. Words cannot tell you how much I miss her. My heart aches everyday. I want to tell you about her, for those who never had the opportunity to meet her. She was pretty fantastic! Lisa-Marie came into my life in September of 2003. She truly rescued me. Rich and I decided that Elvis, our amazing rat terrier, need a brother or sister. He had been an only child (besides his rabbit sister, McKenzie) since we got him. So, we had been keeping our eyes...and hearts open to see who would choose us. On a Saturday morning, we decided to go to the SPCA of Wake County. I walked into the room with kennels on each side and began going down the left side. I got about 2 cages in and dissolved into tears. All of these wonderful babies needing homes absolutely crushed me. Just to know that by not choosing a specific one, I was giving him/her a death sentence. How is that fair? Okay...I can't go into all of those feelings right now. Let me just say before moving on, PLEASE SPAY OR NEUTER YOUR PET AND DO NOT CONTRIBUTE TO THE SENSELESS KILLING OF THOUSANDS OF ANIMALS EVERY MONTH!!!! Anyway! I played with a few through the cages and got lots of sloppy kisses. The only thing we really had in mind was a dog who would remain under about 30lbs...just because Elvis was around 22, full grown. We made it to the end of the left side and started walking up the right. We came to this kennel with a TON of brown fur snuggled up in the middle....with a tiny speck of black right, smack dab in the middle of the group. Rich had just asked me what that was when that little black speck lifted her head and let out a huge yawn. Folks, I fell HARD! Her ears were full sized lab ears and her head was about the size of my fist. I loved her. I wanted her. I had to have her. I didn't even know it was a her at the time! We saw a sign on the cage that let us know they had all recently had surgery (spay/neuter). Rich asked me if I would at least like to hold her first before making a definite decision. I told him no because i just knew that she would be my forever baby. I was meant to be her mommy...Rich was meant to be her daddy...she had, indeed, chosen us. I'm going breeze through the adoption process because honestly, it was hell. Let's just put it this way, before it was over, a volunteer offered to hold "Satin", Lisa-Marie's name at the time, while I climbed the fence and put her in my car! It took us 5 hours to adopt her and once I had her in my arms, I never set her down again. I could tell you SO many Lisa-Marie stories...I have tons of favorites so I am going to share a few. Elvis hated his sister! lol He was a spoiled brat when she got home....I love that boy with all my heart, though. Lisa-Marie WORSHIPED her brother. She followed him around and wanted to just be with him. He finally came around, but her adoration for him was always apparent from the very beginning. Lisa-Marie grew like crazy, got into everything, and stole the hearts of her mom and dad in an instant! I wanted her to be a girly-girl, but she would never me one! She was tough as nails, while being the biggest baby all at the same time. Lisa-Marie slept with us from day 1. The bed became hers and she would eat any furry critter that tried to think otherwise. To be such a loving girl, she could also have a mood swing from hell. Her and Elvis got into a few battles that caused both of them, along with daddy, to be put on antibiotics to prevent infection from teeth wounds. Never anything serious, thank God! When Elvis had to go through Chemo treatments and had to be at the Vet all day, it was quite a homecoming when he returned. She would sniff him and kiss him all over as we tried to walk in the door. They were a great team, especially at the holidays. Elvis would open the gifts and Lisa-Marie would grab the toy and run! She LOVED toys. :) Balls were her favorite thing in the world! I will never forget the first time she was given a squeaky ball! The way her eyes lit up when we held it in our hand and squeezed it was priceless. Lisa-Marie was SO in tuned to my emotions. If I cried, she was right there making sure I was okay...all it took was a sniffle to upset her to no end. When my mom, dad, and sister each passed away, Lisa-Marie never left my side. That girl stayed in bed with me for hours, allowing me to cry until my heart couldn't cry anymore...she would press one cheek to one side of my face and place her paw on the other. Wow...I felt a huge tug at my heart as I typed those words. She had a profound impact on my life. When you would ask Lisa-Marie for a kiss, she would thrust her cheek to you for a kiss. She LOVED to have her mom and dad lay their mouths against her cheek and making kissing noises while smooching her. She would give you a "high-five" with just a simple request. She could also turn the lights off on command. Her FAVE pastime was taking things back in forth to mom and dad. Daddy made a goof one day and gave her his phone and asked her to take it to mom...her brothers (Hendrix & Presley) were wrestling and tripped her. She almost dropped it so in order to get a better grip, she bit down a little too hard and it cracked the screen. She didn't drop the phone though! Lisa-Marie had SO many nicknames and answered to ALL of them. Our pet sitter gave her the name, "Lee-Lee", Daddy gave her the name, "LeeBear" and "Ebony Princess", Mama called her "Baby Girl". She also answered to, "Bear", "Lee", "Boo-Boo", "Bear-Bear", and just "Lisa". The name Lee-Bear came from the grumbling noise she made when she was loving you. Lisa-Marie was called the "Miracle Dog" by Clayton Animal Hospital Staff. She developed a pinched nerve in her neck and was completely paralyzed for 3 months. She made a full recovery, thanks to her "Uncle Mike" who stayed with her while mommy and daddy were at work. She also had knee surgery that she amazed everyone after. She started "toeing" that same day and was walking the very next day. Mommy slept on the floor beside her on her twin-sized mattress for 3 months. We did this for the 3 years after she was healed because she wanted to sleep there and have it during the day. Daddy soon got lonely shortly after she was better, so he went and got another twin mattress to go on the floor...this way we could all sleep together. Whatever she wanted! Lisa-Marie loved going for rides BUT she hated the Vet. She had to be carried in by her daddy and he held her the whole time. Did I mention she was right at 70lbs? :) She was a big baby in that she sounded vicious when first meeting her, but if you ignore her for a few, within 5 minutes she was going to be bringing you a ball! Lisa-Marie loved passionately...and fought passionately. Lisa-Marie did things on HER terms...she could be a stubborn girl! This included the way she died. It was on her terms. She had been getting a little "clumsy"...mommy noticed and was getting scared...this is how the paralysis started before. Within a few days, she couldn't walk. She could move her legs, but it was as if she couldn't feel her front feet. We took her to the Vet and Dr. Beam came out to the car. She gave her steroids and we had pain meds so she would be comfy. We knew she couldn't go through 3 months of this again. It hurt her pride so badly last time...and aged her. We decided that we would give her time to see if the steroids would help before making a decision. This was right before Christmas. Daddy took her to work with him...Uncle Mike went a couple days, Uncle Shea helped half a day, then Mommy went when I got off school for Christmas Break. It took 2 of us to carry her outside to potty. Christmas Day, we decided that we weren't going to anyone's house even if that meant having Christmas with just out little family...Rich, the dogs, and me. That was the best decision we ever made. I was extremely emotional that day. I guess my gut knew what was coming. The days leading up to this, Lisa wasn't in pain. She was eating fine...get PLENTY of chews, and eating all the treats we would give her...even barking for us to give her one! On Christmas Day, she wouldn't eat. Each time she would drink, she would spit it up. Mommy and daddy started giving her ice chips a few at a time because steroids make you thirsty. She rested comfortably but wanted someone lying with her at all times. I alternated between laying with her, kissing her head and her pushing back against my mouth to make the kissing noises and crying in the other room. She was so in tune to my emotions that I couldn't cry around her because she got upset. We would flip her over every hour so she wouldn't get sore (we had been doing this all along as well as the last time she went through this) and placing pillows between her front and back legs so she would be comfy. The last time we flipped her, it was around 3am. She had her head on the pillow and a pillow between each of her legs. She was nose to nose with her daddy and her brothers were at her head and feet. At around 4am, Rich told me something was wrong with Lisa. I asked what he meant. He informed me that he thought she had passed. I immediately got down on the floor beside her side of the bed and placed my head on her chest. Our baby was gone. Her head still on the pillow, pillows still between her legs, and her brothers still lying in their respective spots beside her. She didn't make a sound...I could literally hear a little squeak from her and be jolted out of a deep sleep...that's just how I was with her. My baby girl knew her Mama and Daddy had a hard decision to make and that was her last gift to us...she died in her sleep, with the people she loved...and loved her nearby. That is the only comfort I have in losing my baby. Lisa-Marie was so much more than "just a dog." It pisses me off to NO end to hear people say that. I feel sorry for them because that means they have never known unconditional love...they have never been rescued by a furry critter...they have never known a love that could surpass any love felt by any man or woman...they have never experienced the sheer adoration that a loyal canine gives to his/her "Forever Person." I can only pray that every single person in the world can experience this at least once in hi/her life. I have a huge hole in my heart...one that I don't ever think will be filled again. A part of me is with my baby and I will get that back one day when we meet again. Until then, Lisa-Marie, I will never, ever forget you...I will never ever forget the gratitude I feel in my heart right this very second for you having come into my life. I can only hope and pray that you got as much from me as I did from you. If you did, your life was complete. I Love You, Lee. Sadness about Eggs...but with gratitude! I have been getting my eggs from the same people for about the past 8 months or so. I stumbled across their ad on a community website selling fresh eggs for a BUCK a dozen! Regular, yucky, commercial eggs sell for more than that AND I usually pay about $3 a dozen for fresh eggs. I hit the jackpot and had been buying 10 dozen at a time. We use a lot of eggs because we both take them to work everyday for a great source of protein. And according to the USDA, eggs stay good for MONTHS! Now for the sad part....they sold their chickens....sad, sad, sad. I finally got in touch with them a little over a week ago and the guy said that although they have no more chickens, they still had lots of eggs and could hook me up. These are two of the nicest people you'll ever meet. He told me to come by that evening and they would make it happen. All of my yummy eggs! When I got there, they had my eggs (10 doz) ready to go. As I tried to hand him a 10 dollar bill, he told me no, they're yours. So, so kind! That made me smile but I am still sad about the thought of having no more! They had all kinds of breeds even Easter-Eggers which lay eggs in gorgeous hues of green. LOVING me some Purex Insiders and GIVEAWAY! 1) REQUIRED entry: Become a followers of my blog. After you do so, leave a comment saying that you did! If you already follow, just leave a comment telling me that! Once you are following me, when I announce the winner, you will receive the post via email and be able to let me know that you acknowledge your win! Then I can email you for your addy to snailmail the coupons! 2) For another entry, leave a comment telling me the top 3 things that you look for when purchasing detergent. 3) For a third entry, there is a contest going on through Purex Insiders. There is a $1,000 grand prize and fifty 2nd place winners will each receive $40 in gift cards. As I mentioned I love this company and they are very honorable so I have no hesitation give you the link to click on to enter! http://insiders.purex.com/soft-scrub?id=14227t Follow the link and enter to win for your third entry! Leave a comment below telling me you have done so! I made a friendship jar for each of my friends who had surgery last year. I had maybe $1.50 in the entire gift, but it was a hit with each of my friends as well as their families. I was told by one of the family members that I was the most thoughtful person she had ever met. That made me feel good. I enjoy giving gifts. I always have. Now that money is tight, I have to think outside of the box. This can def be a good thing because instead of picking up something from the store to give to someone, 9 times out of 10 I'm gonna make it. I can honestly say that every handmade gift I have ever given has been well-received. I think the reason is the recipient knows more thought was put into other than shelling out a few bucks. Anyway, here you will see original instructions and where I got the idea from. I am going to post the directions to their original concept, but I'm going to tell you have I modified to fit my situation. Both of my friends had gastric bypass surgery. Having had the surgery myself in 2005, I know how much their lives are going to change. With that being said, on each slip of paper I included in their jars I wrote a positive mantra that they could look forward to. .
Finding your size at thrift stores. NOT paying more for your clothing just b/c you can afford that extra cheeseburger! Fitting comfortably in a booth. Not checking the weight limit on everything you buy, stand on, sit on, etc. Scissors or Fiskars Personal Trimmer I used the scissors that cut in the cutesy patterns-$1 each! You can find fun jars at thrift shops and garage sales, you just want a wide mouth jar so it’s easy to put your slips of paper in and out of the jar. You can tie ribbon or embellish the jar with your favorites. Handwritten messages: Cut slips of paper with scissors or personal trimmer. 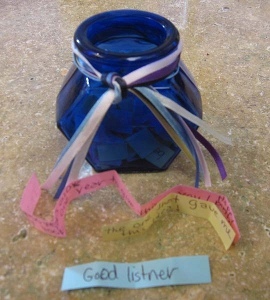 You can use one color of paper or use several, personalize this to the event or person getting the Friendship Jar. Write out positive words or statements. For example if this is for a special aunt you could write out all the things you love about her from her pretty smile to her fabulous chocolate chip cookies. Fold up the slips of paper and place in jar. I always recommend handwritten notes because the message and words just seem more unique written by you! Computer generated messages: This is easy and quick, and if you are a neat freak using a computer will make you happier. Have fun and play with fonts and font size! Write out positive messages and words like described in Step 2. Print. Using your scissors or personal trimmer cut into slips of paper, fold, and place in jar! To lubricate things....GET YOUR MIND OUTTA THE GUTTER! Hmphf! They recommend using it on lawn mower blades that begin to get rusty. I will say, even when I don't have WD-40 on hand, I promise I have PB! Giving your puppers meds. We do this and it is awesome! We started all of our guys young taking their meds w/ PB. Now, it's a treat for them to get things like Benedryl! In place of butter in recipes. It gives a yummy, background flavor! Yummm! Bait for Mousetraps...it's a wives' tale that mice like cheese. They will come for PB instead. I have to say, I have a problem sharing my PB with the rats! To remove sticky tags from surfaces...like that price tag right on the front of the mirror you buy at the store of yard sale! Ugh! Just smear a little PB on the spot with a rag and rub off! To make your house smell good after cooking fish...yeah, seriously! Put a couple of tablespoons in a frying pan and fry it down for a couple of minutes. Of course, I would worry about playing hell trying to clean the pan!! To polish leather furniture. You know, I LOVE PB, but I don't know that I want my couch smelling like it simple b/c my dogs would eat my furniture! They say to mix a tiny bit of perfume oil in it to combat this...sounds like work to me...but anyway, wax on, wax off! To remove gum from your hair or the carpet...this is great for moms! Have you ever used PB as something other than an edible? Let me know! Beginning on the top left: Homemade Tie-dyed cupcake complete with a hibiscus pick with whale crackers, below that is a boiled egg shaped as a fish, decorated with my edible markers, and yes, dyed blue! In the large compartment is where all of the magic happens...LOL...kidding...anyway...I made a quick, homemade mac n' cheese using mini shell pasta, Parmesan and Monterey Jack Cheeses, and a little milk...I cooked the noodles w/ blue water. On top of the shell ocean are 2 hot dog octopuses with faces frawn on w/ edible markers. This is decorated w/ a parasol toothpick and a pink flamingo pick. Octopuses...or is it Octopi? Haha! I am a "thirty something", seventies baby who loves the technology era! I am a full time high school special education teacher. I am a former high school cheerleading coach which I really enjoyed but gave it up for reasons taht we won't discuss! I am the youngest of 10 kids...nope that's not a typo! I have been married for 12 years and have 3 furry babies...they are my world!! Although I love technology, some say I was perhaps born too late! I love to can and make jams and breads from scratch. I also care about where my food comes from and what it's composed of...don't want to put funk in our bodies! LOL At the same token, I am CHEAP! I'm not going to pay an arm and a leg for it either!! Summer Bento Blog Hop Inspiration....I LOVE the Beach!